Happy Friday everyone! This week has been one of the long ones. It has felt never ending, so I could not be happier for the pending weekend, but before we get there, let’s talk about Girl Scout Cookies. It seems with every year that Girl Scouts come around selling cookies, it gets harder and harder to resist buying a box or two (or more, don’t worry I won’t judge). From Thin Mints to Samoas (or Caramel Delights for some of you), these cookies are too good to resist! And now, I have a little secret for you. Did you know you can get Thin Mints and Samoas year round at the grocery store? You may be thinking I am playing a joke on you, but I'm really not. 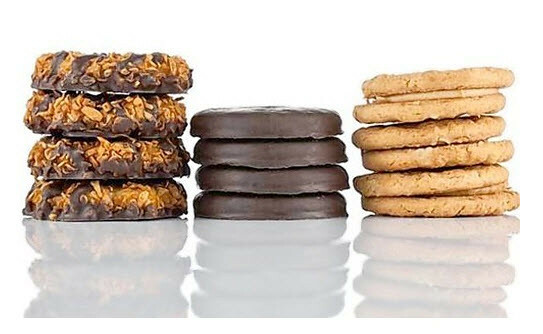 Girl Scout Cookies are made by two different bakers, that’s why some Girl Scout Cookies names differ. And, one of these bakers is a subsidiary of Keebler – you know the cookie company with the Keebler Elves. Well those smart Elves had the brilliant idea to make the same Girl Scout cookies everyone loves for grocery stores, but under different names, Grasshoppers for Thin mints and Coconut Dreams for Samoas. So now no matter the time of the year, you can get your Thin Mint and Samoa fix.